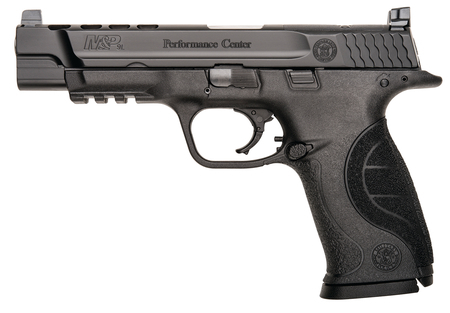 S&W M&P 9 Performance Center 9mm 5 Inch Ported Barrel and Slide Black Finish 17 Rounds. Striker Fire (double action). White dot dovetail front sight. Fixed 2-dot rear sight. Polymer grip and frame. Black durable corrosion resistant finish. Ported barrel and slide to reduce muzzle flip. Adjustable trigger stop to stop trigger over travel. Three interchangeable, newly-enhanced, textured palmswell grip sizes for better control and fit. C.O.R.E. Competition Optics Ready includes optics mounting kit. Slide cut to accept the following optics: Trijicon RMR, Leupold Delta Point, Jpoint, Doctor, C-More STS and Insight MRDS. Enhanced trigger and Performance Center sear.